Furniture design isn’t easy, presenting many challenges when it comes to teaching the next generation of designers. 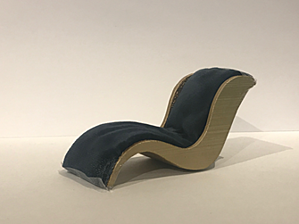 For this month’s blog we spoke with 2 designers, a design educator and a student to understand how they interpret the learning process when it comes to furniture design with a particular focus on seating. In addition, they discuss the ways in which technologies impact this process. What is the most difficult part about seating design? The primary issue is comfort and scale, especially when it comes to seat cushions for different age groups enabling an individual to push out of a chair. The density of the foam from a comfort level perspective and of course code compliance issues all play a key role. What is the easiest way to make seating more comfortable? We are not a catalog firm and we work with Samuelson to gain inspiration in the marketplace from what we feel is new or coming back into the market. We draw it and send it to them for a style we want. As a designer you can reflect other product dimensionality that makes it work and that will make it feasible, assuming you have the right manufacturer to execute the design. How do you address posture in seating? It depends on the use of the seating. In lounge seating design, for example, you have to consider the various user groups and what is being done in that chair; if consideration is given to small plates served for those in lounge seating versus sitting properly for dinner where the user wants to sit up to the table. What elements must be accounted for when designing seating? One must regard the structural frame, the deck or seat, the type of strapping and the internal seating components as well as the back. You must consider where the top of chair hits you in the back and think about ADA considerations for arm compliance and whether that arm also goes under a table or desk or whatever. Finally, be sure the dimensionality of the product is correct. In public area seating, why would you design a bar stool with no back? At a community table, as opposed to bar, we use backless bar stools, so someone can swing their leg over and do half side seating. Community tables present a different opportunity to sit. At the bar we must think about clearance, if it should it be swivel or fixed, and if swivel causes a change in numbers of seats. Then, of course, there are style issues to consider. How do you provide stability in seating design? We think through the engineering and density of the wood to make sure legs don’t split, and decide if there will be a stretched straight [connector] between legs or diagonal in the bottom for support. The best thing is to work with a vendor like Samuelson who has done this for years because they have the expertise for what will and won’t work. Samuelson will make a sample or prototype which we will give to our client who will then sit and review it. That prototype should allow us to understand if it will work. How do you make sure the chair or sofa can hold the amount of weight it will be under? We keep the engineering issue with the manufacturer because they put certification on the chairs, but we can tell quickly if something will work. Have you noticed a disconnect between the standard seating measurements and the average human body size? Do you design seating differently in other countries based on body types there? In Italy, for example, chairs may be sleeker and tighter because of their body types. Here in America body type is more bulbous. Italian chairs are not as padded, deep, or as full as Americans may want or need. How do you insure a longer life span on seating pieces in the hotel environment? You must think about the material covering the product which really affects life span. Also, some finishes are more subject to bruising. We do use painted chairs, stained chairs and upholstered chairs. With so many different heights in customers/ end users, how do you determine seat height? Our tables are 30 inches, so we keep it clear for ADA, which is 28 inches. Typically, the seat is 18.5 to 19 inches off the floor. 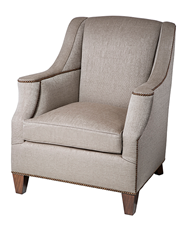 An upholstered chair may look bigger but compresses. 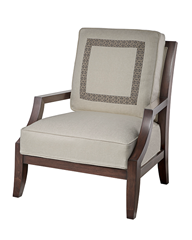 Do you have a standard cushion / foam content that you use for a guestroom vs dining hall, vs lobby area? We have a cushion library and choose from those standards, which we present to the owners. If you are doing a formal dining room sitting for two hours vs quick casual for 45 minutes, the cushioning is different. How do you know that you are getting high quality frame construction if you can't see through the upholstery?You must see the schematic. We may also visit the factory during the production, or a vendor brings the sample to us. Knowing that Judd Brown Designs is prominent in country club design, what are some important qualities you consider in hospitality vs residential seating? Foremost, we identify where the chair is being used and its purpose. Is it a game room, bar area, dining or lobby? One outstanding feature of any of these chairs and their comfort level is the density of foam. In lounge seating, for example, residential seats will be softer, plusher and often deeper. 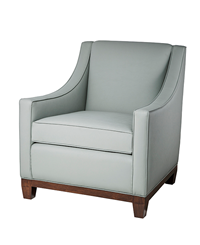 Hospitality seating requires comfort, but with the idea of sitting for shorter duration. In lobby environments we strive to create a residential look with a more durable construction. How do you determine scale, comfort and what is appropriate? Careful consideration must be given to all dimensions; width, depth, height, size and weight of the chair. Interestingly, gender plays a role here as well. If chairs are going in a lady’s card room, the depth must be adjusted accordingly. We will specify a seat with less depth and request a prototype manufactured for review and trial. In other cases if the chair is too deep, we will create lumbar pillows to compensate, which allows flexibility. 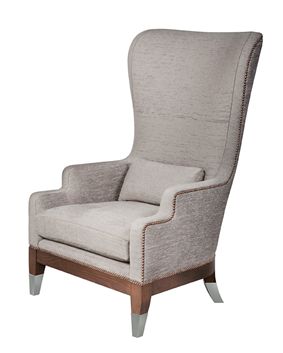 Conversely, men’s card room chairs require more depth, width and possibly height. In addition, where an individual’s back hits the chair back is an important aspect to comfort. Samples prior to fabrication are critical. They enable us to maneuver the specs and know where to tweak. What are some safeguards to facilitate longevity? A good example is the foot rail provided on bar chairs. We specify foot rails on all sides, with metal strips on front and back. We find that people at the bar standing behind the bar stool often rest their foot on the back rail, and the front rail is a given. Without the metal for protection, the rails become unsightly and become gauged. 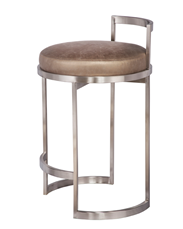 Normally these bar chairs are created with backs for comfort, as guests tend to linger, sit and talk, watch TV at the bar. In a younger club, we can mix and add some backless stools as well. Is there a demand for stacking dining chairs? Many facilities are asking for multi-functional seating today. Importantly, stack-able chairs can fill this need. Generally we require stacking 5 high and commercial furniture is frequently moved around, therefore we look for very durable finish and construction. What is the hardest thing to teach students about furniture design? Manufacturing is the hardest part from that standpoint because it is still abstract to them. You don’t get that experience until you get into the job world and start working on projects. We don’t have a wood shop or metal shop and we try to have them think about the combination of the craftsman manufacturer and designer. What are the challenges about teaching design in a school environment? The manufacturing concept is the hardest part. Our economies have gone to virtual economy. While we have eliminated a lot of manufacturing here in the U.S., we are finding new technologies that will bring manufacturing and design closer. 3D printing prototyping, higher command of computer programs, and robotics will all help manufacture things you couldn’t before because it was too expensive. The tools today allow you to create one of a kind design for the same price as creating 1,000. At Samuelson we show students CNC tech that can customize almost anything. That’s important because customization is leading the market, if you can’t customize, you can’t stay in the market. Schools must try to build better bonds with the locality where they are working. Find local businesses that can use it as a stepping block and have people in the local market come to the school and vice versa. It’s the only way to improve education. What types of projects do your students work on to learn about seating design? It all starts with the design of a chair so, we learn the history and what makes an iconic chair. There are items built in the 1920s-1950s which are still produced today and that is because of adaptability. They have changed with style trends and feature darker metals rather than lighter ones, hard seat vs soft seat, different types of wood and materials to fit in residential living room or conference room or private office. In fact, 75% of what we specify is iconic. What is your go to text book- links- blog- educational resources? The good old-fashioned sketch book. No text book here because there are not a lot of furniture resources. The sketchbook allows students to document the process. It’s important to see what is out there, not an abstract thing in a textbook. Furniture is as technically complicated as designing a skyscraper. What do you wish your students could learn more about before graduating? Manufacturing is a creative process that goes beyond a singular person. Meeting vendors like wood veneer suppliers or fabric/textile suppliers, or furniture manufacturers demonstrate that it is a hands on experience. You must understand the manufacturing process. All great design starts with an understanding of this process. What are the best companies to intern with to learn about furniture design? Samuelson hired someone from our furniture design program but also hired Berkeley students for other departments such as marketing and accounting. 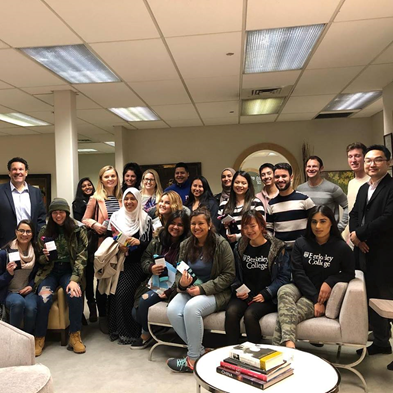 The last two classes toured Samuelson Furniture factory and showroom. They are very generous giving their time to help the students understand the whole process. Students meet the staff fabricating and upholstering and they feel as if they can ask questions. Samuelson shows deep love for their craftsmanship and provides the willingness to explore, challenge and come up with new ideas while giving their staff full support. How has technology changed the furniture design industry? Prototyping, CAD design and computers allow quick creation and tweaking of prototypes. Robotic tech will make for more portable soldering and finishing tools and will help a manufacturer in the process. Having a master person working with robotics is the key. You can send plans overseas to be built in local markets. What advice would you give your graduating students entering the furniture design industry? Surround yourself with the right people, treat everyone as an equal. Some of the greatest designers are manufacturers, they problem solve and aren’t given enough credit. Open yourself to the markets, go to showrooms, go to museums, and visit local manufacturers. Here you will find stories about the history of furniture. What advice would you give new students in your program? Similar, but to the new ones always have a sketchbook and don’t feel like an outsider. The mentality of our faculty is of sharing and helping and supporting. Tap into that resource and don’t be afraid to ask questions. It’s the best thing you can do, clients love when you ask questions, it shows you care. We’re very hands on and open door here. As you change roles from a student to a professional, what are your concerns as a designer entering the working world? At the moment, it would be my limitations. Since I started working at Samuelson, I’ve learned about procedures and what can be done in terms of furniture. It has helped me gain confidence with the design aspect and my capabilities. Even in one single piece of custom designed furniture, there are so many aspects to consider than what designers think. I have seen how important it is, as a designer, to explore your own ideas and be inspired by creative people around you. Having an open mind and being secure enough to express a different spin on an existing concept is powerful. What did you learn in furniture design class that you can't wait to work with out of school? Designing my own piece of furniture! In my Furniture Design class at Berkeley College, I was able to learn the beauty of custom furniture, as well as the design aspect of it. For our final project, we had to design a chair that was functional and creative. It was a tricky project, because some students did not think about the functionality of the chair, but rather the design. As a designer, we must learn that we are not designers to make things pretty in this world, but to create functional spaces/pieces that will impact the space in a positive way. What areas do you wish you learned more of in school? Construction would be one thing I wished we had learned more of in school. In our construction class, it was great creating models and drafting by hand constantly about construction, although we briefly went over the use of materials used in construction. I wish we could have focused on commercial/residential materials and finishes. I feel like those aspects are a great part of interior design, but are not focused upon as much as they should be. Are there any topics that weren't covered in school that you learned through internships? I learned more through my internship about what types of materials can be used in furniture manufacturing including: wood species, veneers, and different types of finishes and use of technology within furniture. This includes the use of LED lighting in case goods and seating, as well as plug and play features. I have expanded my knowledge of furniture design. I am now able to create my own furnishings with proper scale and standards, which help me with space planning and design. I know more about the construction of upholstery such as spring vs webbing and their usage. I have watched state of the art machinery, including CNC carvers, at work. I also learned more about durability and other materials that stand up to abuse such as stone and metal. What challenges as well as insights have you discovered around furniture design? Use of material and the way it is engineered. I’ve seen some challenging pieces, but with help of my supervisor and coworker, it’s been interesting to learn about this aspect of design. I am constantly coming across new challenges, and I’ll overcome them if I put my mind to it. I would advise my fellow students to pay close attention to their design specifications. A company like Samuelson will advise if a spec seems unrealistic or may require adjustment due to scale or other factors, but it is our responsibility as designers to provide thorough specifications. I have seen how the use of 3D rendering is valuable in avoiding mistakes and saving time for all parties, which is why if a piece of furniture may seem confusing to the designer in 2D, I will immediately create a 3D rendering of the piece for a better understanding for the clients. I have also been witness to the creation of a model or prototype from a block of wood, helping me realize the importance of even the smallest detail. What is your generation’s relationship with furniture? What would you like to see change, what would you like to make sure stays the same? What I wish would change is how concealed designers want the construction aspect of furniture to be. We recently did a flip desk where we needed a handle or latch screwed in from behind the desk and the designers didn’t want the screws visible. This made it more difficult for woodworkers to execute the design. What advice would you give new students coming into the program? Make sure you do your research and aside from making it look pretty, understand the function of the piece or space. It may look beautiful, but if it doesn’t work well, it won’t be used. Consider the purpose of the piece or space. If it is a chair, for example, think about where it is being placed, the design concept, and both the function and the comfort level. What advice do you wish you had as a new student? To not restrict myself so much. I overthought things when I should have been focusing on how to interpret concept into the design without it being an issue. Also, that without research you are unable to properly design. Design professionals at all levels, whether students, teachers, practicing designers or architects, integrate their knowledge, experience and creativity to realize the evolution of a design concept. Applying basic standards of form and function to the creative process continues to provide us with fresh and unique spaces to live and work. We must remain open to the ways in which we develop one another’s potential.